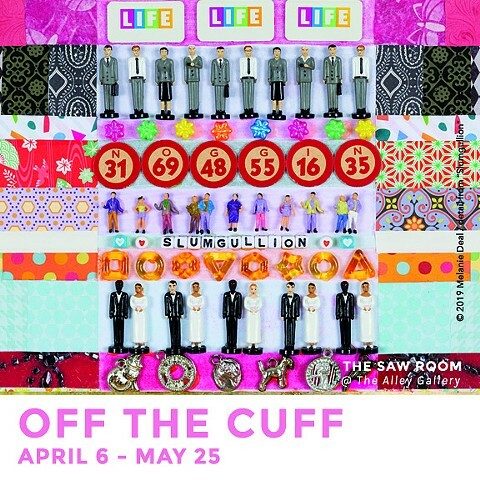 I will have six artworks in this show in The Saw Room at The Alley Gallery in Evanston. The other artists are Corey Ciszek, Howard Kanter, and Steve Sager. There was a large turnout this evening for the “Inside the Box” opening at The Arts of Life Gallery. 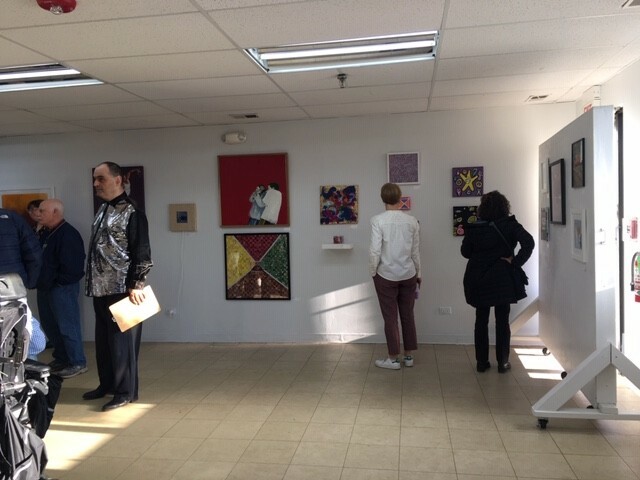 This nonprofit organization, located in Glenview and Chicago, provides people with intellectual and developmental disabilities a studio for creating art—and also lots of encouragement.This juried exhibition was open to artists of all levels, demographics, and abilities. That’s my “Square Meal” on the far wall. I have nine artworks on display at Backlot Coffee for the month of February. Come check out this very cool space at 2006 Central St. in Evanston. 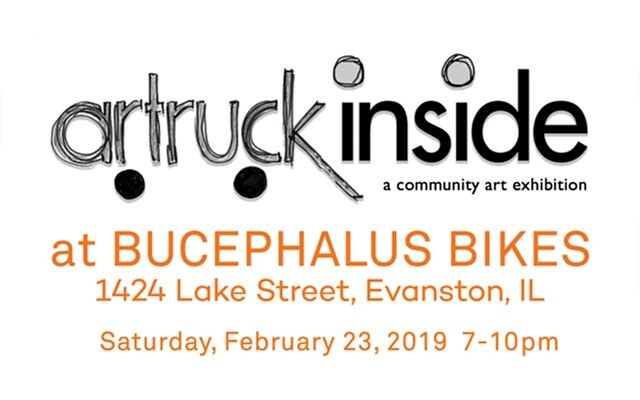 Join us for art, food, and conversation on Saturday, February 23, 7–10 p.m. Artruck Inside is at Bucephalus Bikes in Evanston, 1424 Lake St. (across from Penny Park). 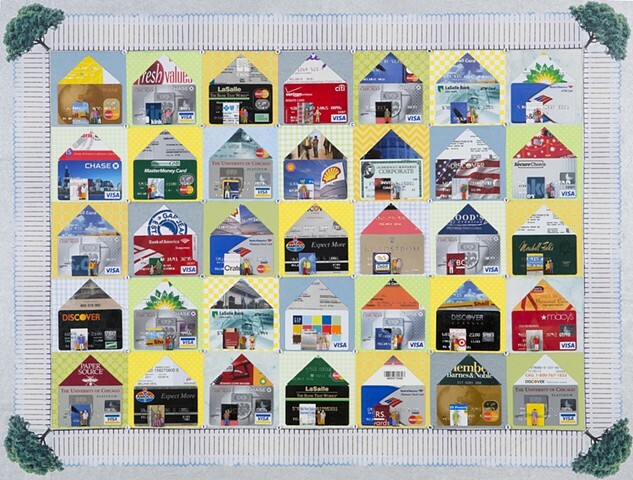 That’s my “Travelogue” collage (top center) at Woman Made Gallery’s “Quilt + Resist” show, November 9–December 1. This fun student-made video is a quick tour of the “Nevertheless, She Persisted” show I’m in at Koehnline Museum of Art. You can see glimpses of my “I’m with Her” collage. I will have an artwork in the “Nevertheless, She Persisted” show at Koehnline Museum of Art, September 27–October 19. The gallery is at Oakton Community College, 1600 East Golf Rd. in Des Plaines. Do join me at the opening on Thursday, September 27, 5 to 8 p.m. I'll have an artwork in the International Open at Woman Made Gallery—now in Pilsen at 2150 S. Canalport. The show is August 17 through September 8. Join me at the opening on Friday, August 17, 6 to 8 p.m. 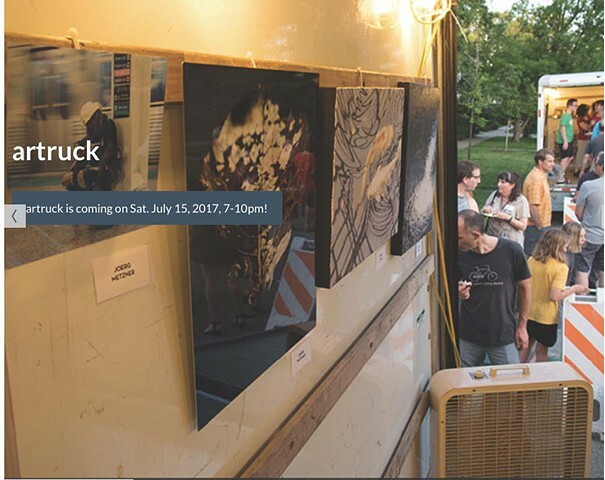 I'll be showing artworks at artruck on Saturday, July 14, 7 to 10 p.m. Join us for art, food, and conversation—all free! 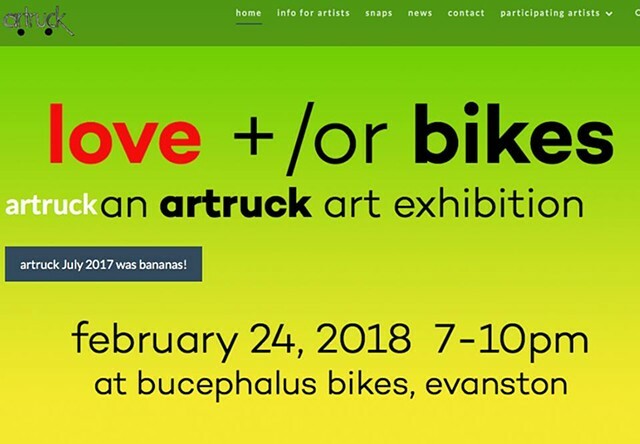 I’ll have an artwork in an indoor artruck exhibit on Saturday, February 24, at Bucephalus Bikes in Evanston (1424 Lake St.). It's 7 to 10 p.m. and will feature food, drinks, and ART. 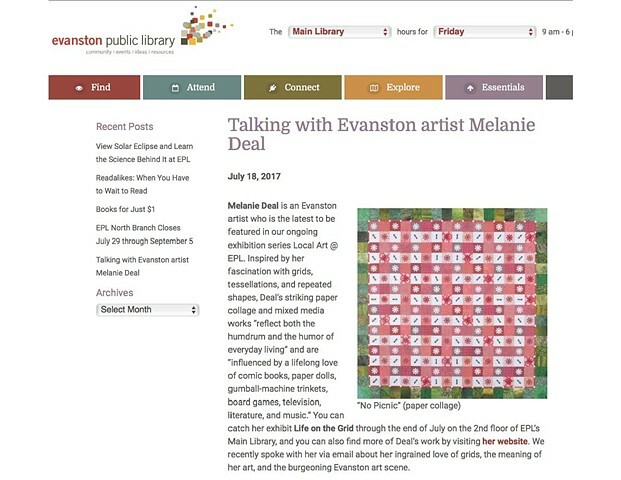 This interview appears on the Evanston Public Library website. Yay! 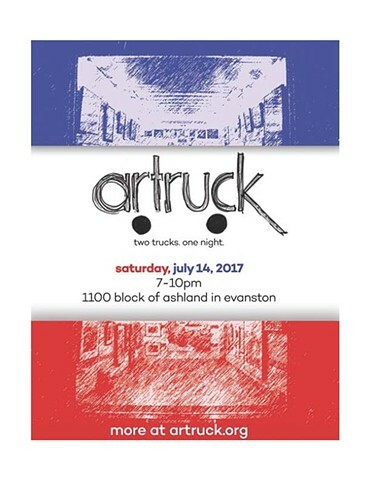 It's another artruck event in Evanston on Saturday, July 15. Join me and a lot of other local artists in the 1100 block of Ashland between 7 and 10 p.m. for art, food, and conversation. I have a solo exhibition at the Evanston Public Library (main branch). It’s on the second floor and will be there for the month of July. Stop by if you get the chance! 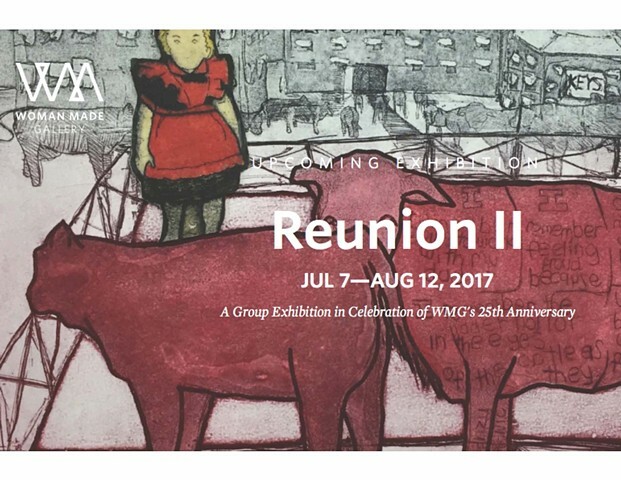 I’ll have an artwork in the “Reunion II” show at Woman Made Gallery, July 7 through August 12. The opening reception is July 7 from 6 to 8 pm. at 685 N. Milwaukee Ave. in Chicago. 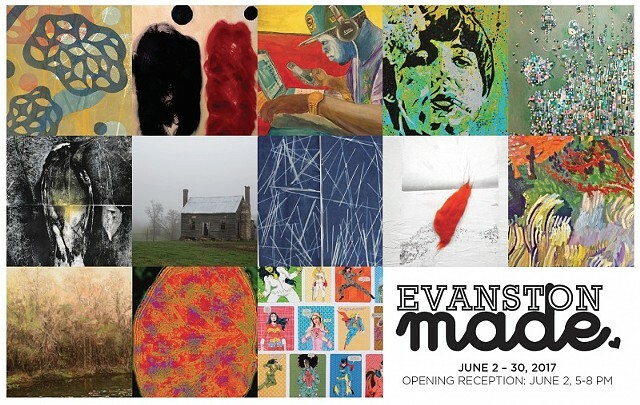 I'll be part of a group exhibit at the Evanston Art Center June 2–30. The opening is Friday, June 2, from 6 to 9 p.m. Hope to see you there! 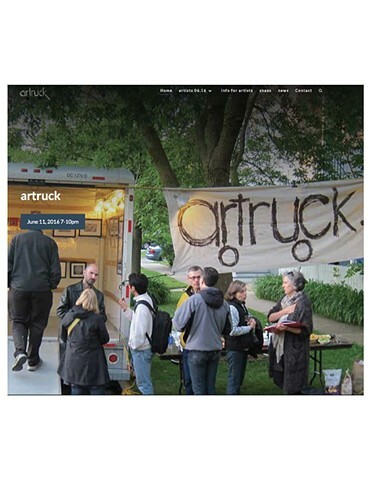 There will be another artruck event in Evanston on Saturday, October 22, and I'll be there with some of my artworks. 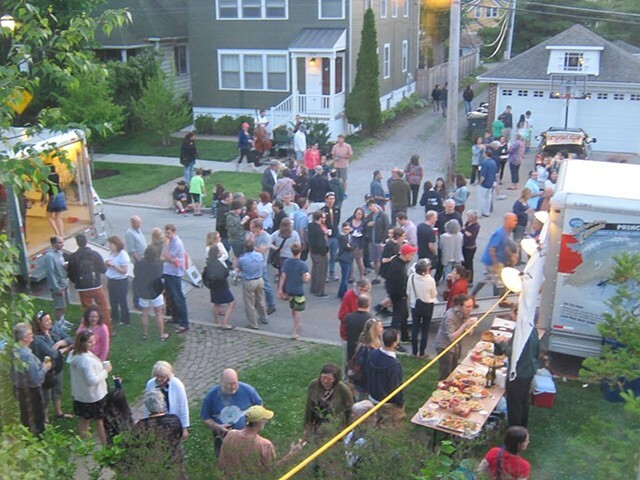 Join us in the 1100 block of Ashland between 7 and 10 p.m. for art, food, and conversation. I have an artwork in the Wilmette Public Library’s 32nd Juried Art Show, September 23 – November 3. The opening is September 23, 6:30–8 p.m.
On June 11, I will be showing several artworks at artruck, a one-evening event on Ashland between Greenleaf and Crain in Evanston. I'll be there 7 to 10 pm. Join us for art, food, and conversation! I'll be part of a group exhibit at the Evanston Art Center June 3–30. The opening is Friday, June 3, 6 to 9 p.m. Please join me there! I'll be showing nine new artworks in the main room at Creative Coworking at 922 Davis St. in Evanston. 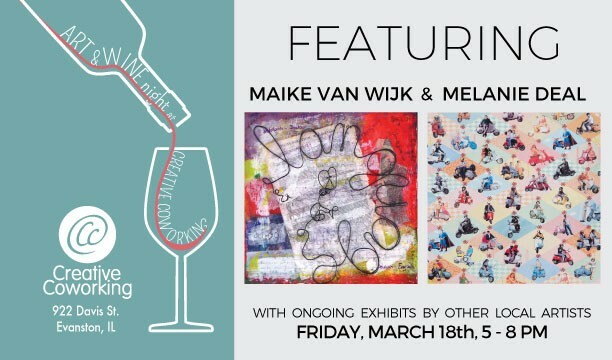 Come enjoy the art, wine, food, and conversation! I'm happy to be featured in this blurb about Evanston's Public Art Loan program. This two-day conference will be held at the Hilton Orrington Hotel in Evanston on September 28–29. I will have two artworks on display in the meeting areas. From the website: "More than 300 artists, arts managers, and arts supporters will come together in Evanston, Illinois, this fall for the biennial One State Together in the Arts conference. Co-convened by Arts Alliance Illinois and the Illinois Arts Council Agency, One State is the only statewide, multidisciplinary conference for arts leaders and practitioners in Illinois. 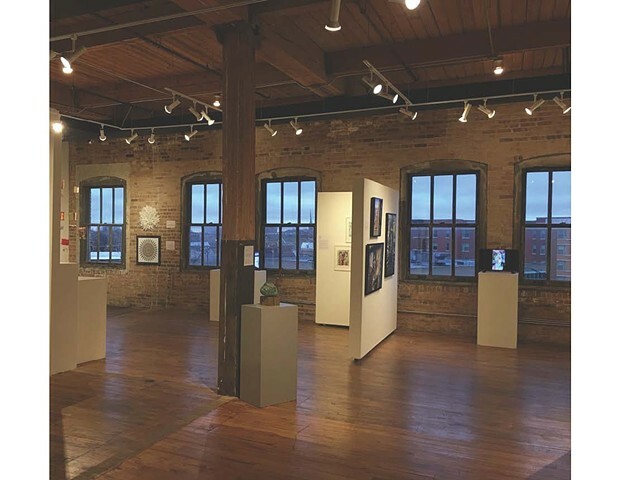 Since 1999, One State has served as a forum for creative professionals and arts-passionate people from across the state to come together to network with peers, discover resources, and gain new insights." There's an interview with me on the Creative Coworking blog. 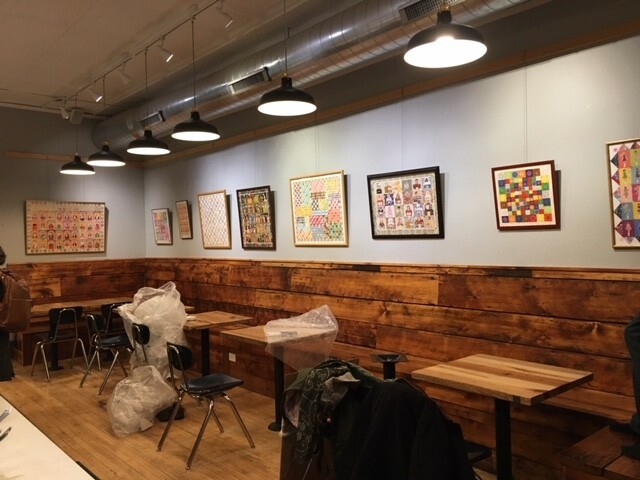 I'm honored to have had artworks hanging on the walls of that Evanston business since it opened in 2011. I have an artwork in the group show "Gendering Desire" at Koehnline Museum of Art at Oakton Community College, 1600 E. Golf Rd., Des Plaines, IL. The opening is October 2 from 5 to 8 p.m. I'll have three artworks in the "Upcycled" show, September 3 through 30 at IPaintMyMind Gallery, 2545 W. Diversey in Chicago. The opening reception is September 3 from 7 to 9 p.m. I have an artwork in the "Contained" show at Woman Made Gallery, July 11 to August 21. Woman Made is at 685 N. Milwaukee Ave. in Chicago. I'll be at the opening reception on Friday, July 11, 6 to 9 p.m. Stop by and say hi if you can! I have nine artworks in the Revolving Art Show at As You Like It Gallery at 827 Chicago Avenue in Evanston. The show will be up for several months, so stop in and take a look. 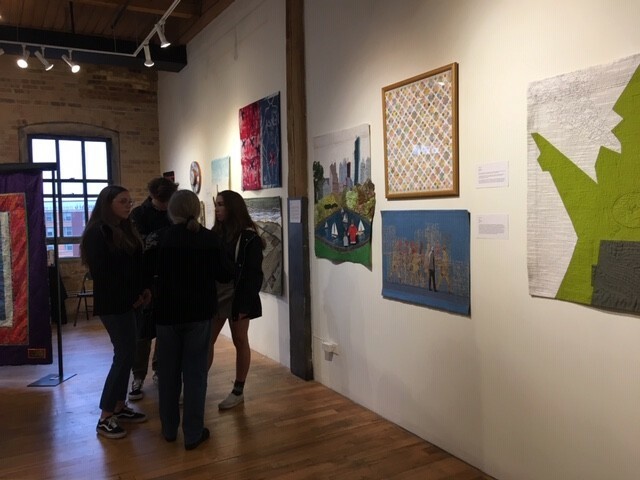 The Evanston Arts Community will host Open Studios Evanston on June 7 from 3 to 8 p.m., opening studio doors to the public to view artworks and works in progress. I'll be at Creative Coworking (922 Davis St.) from 3 to 5. Stop by and say hi! Friday, November 8, 5 to 8 p.m. — Yes, I always have several artworks on display at Creative Coworking, 922 Davis in Evanston. However, this time I'm a featured artist in the front room. I'll be showing nine new works. Angela and the CC staff always throw a delightful party, so please come share the fun! Friday, April 26, 5 to 8 p.m. — As always, I have artworks on display at Creative Coworking, 922 Davis in Evanston. Come join the festivities! I have an artwork in the "Surrounded" show at Roman Susan Gallery, 1224 W. Loyola Avenue in Chicago (near the Loyola el stop). The opening is March 29 from 6 to 9 p.m., and the show goes through May 6. My solo show entitled "Cut and Paste" is at the Independence Branch of the Chicago Public Library, 3548 W. Irving Park Rd. The exhibit is during the month of March to celebrate Women's History Month. If you're in the neighborhood, stop in and take a look. Friday, February 22, 5 to 8 p.m. — I have four artworks on display at Creative Coworking, 922 Davis in Evanston, including some new ones. Come join the fun! Friday, December 7, 5 to 8 p.m. — Check out the artworks and the workspaces at Creative Coworking, 922 Davis in Evanston. I have four pieces on display, and my friend Laura Allen-Simpson is a featured artist for this event. I'll have an artwork in the show "Recent Works by Gallery Artists" at Gillock Gallery, 1127 Florence Avenue in Evanston, October 5 through November 1. The opening reception is Thursday, October 18, 7 to 9 p.m.
Creative Coworking is having an open house on Sunday, October 14, from 5 to 8 p.m. I have four artworks on display, and my friend Darlene Grossman is a featured artist for this event. Join us at 922 Davis St. in Evanston. 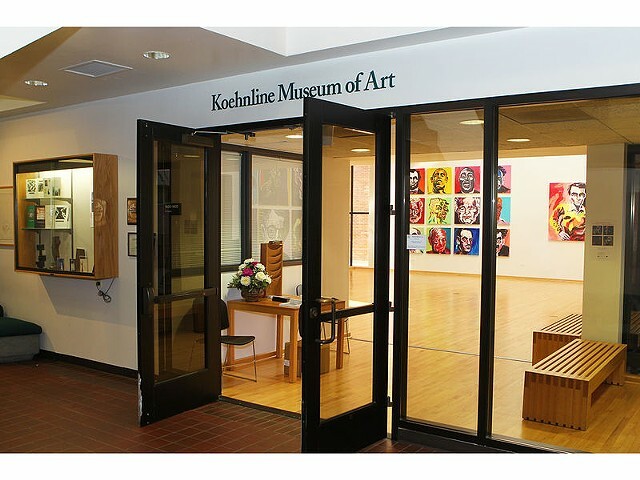 I'll have an artwork in the exhibit "The Personal Is Political: The Transformative Power of Women's Art" at Koehnline Museum of Art, Oakton Community College, 1600 E. Golf Rd., Des Plaines, IL. The show runs from October 4 through October 26. I'll be at the opening reception on Thursday, October 4, 5 to 8 p.m. I have two artworks in the 4th Annual Green Arts Show, September 7–23. Location: Noyes Cultural Arts Center, 927 Noyes St., Evanston, IL. I'll be at the Artists' Reception on Friday, September 7, from 5 to 8 p.m. The show is sponsored by Citizens' Greener Evanston. Creative Coworking, at 922 Davis St. in Evanston, is having an open house on Friday, August 17, from 5 to 9 p.m. I have three artworks on display, and my friend Ron Rutkowski is a featured artist for this event. 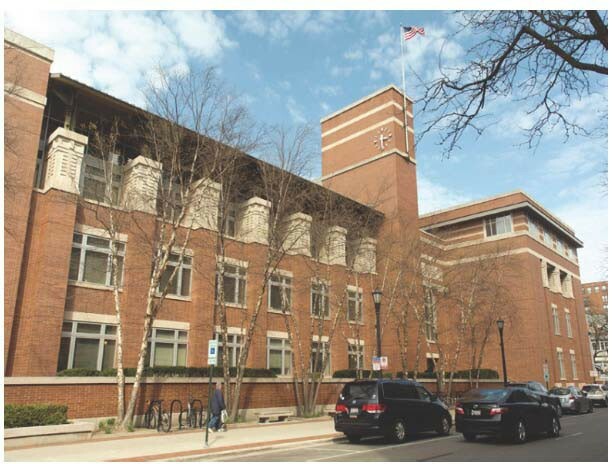 Creative Coworking, at 922 Davis St. in Evanston, is having an open house on Friday, June 8, from 5 to 9 p.m. There will be drinks and appetizers and new art exhibits. I have three artworks on display. Ron Rutkowski and I are having a show at Morpho Gallery's pop-up space at 208 S. Wabash in Chicago. The opening is Friday, May 25, from 5 to 9 p.m. Before you take off for the Memorial Day weekend, do stop by! Creative Coworking, at 922 Davis St. in Evanston, is celebrating its one-year anniversary on Saturday, March 24, from 4 to 8 p.m. There will be live music and new art exhibits. I have three artworks on display. I have two artworks in the Love Art Show at Blick Art Materials in Evanston, 1755 Maple Avenue (close to the Davis el and Metra stops). The show is from February 6 through March 18. The opening reception is Thursday, February 9, 6 to 8 p.m. Stop in and take a look! I'm very pleased to be included in the Midwest Edition of New American Paintings, no. 95. The juror was Julie Rodrigues Widholm, Pamela Alper Associate Curator, Museum of Contemporary Art, Chicago.